On Thursday May 15th the Federal Communications Commission is set to vote on a proposal that would give corporations like Verizon and Comcast the power to create a fast lane and a slow lane on the Internet. The fast lane would be reserved for the privileged websites with the money to pay for quicker service. 1. Call the FCC: Tell them this proposal has got to go. 2. Let your friends know on Facebook and Twitter: Change your profile pic, cover photo or send a tweet to members of Congress. 3. Share Pictures: Show rather than tell the FCC how you feel. Share a picture on Instagram or Twitter with the hashtag #mediajustice. 4. COME TO WASHINGTON D.C.: If you’re near D.C. and want to come down the rally begins at 9am outside the FCC. Will Our Voices be Silenced Online? 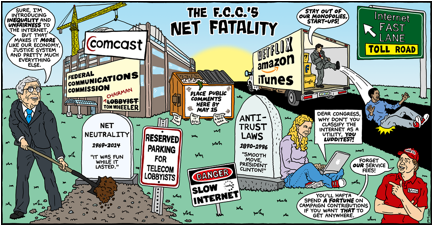 MAG-NetCalls on the FCC to Protect the Open Internet, and Our Communities Now! Presente: Tell the FCC: Stand Up for Internet Freedom! What’s at Stake for Latinos Without #NetNeutrality? Meanwhile, thousands of people protested in Mexico over a bill to kill the Open Internet. The protests were successful in stopping the bill.